Home » Shop » Hour Meter Vibration Activated. 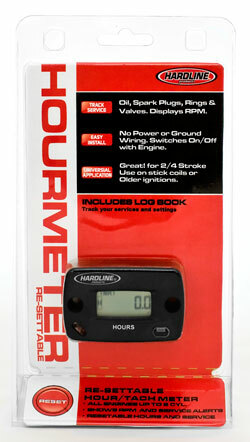 Home / Hour Meter / Hour Meters & Brackets for any Gasoline Engine / Hour Meter Vibration Activated. Meter automatically switches on/off recording time by sensing vibration from the device in use. Do not use on Offroad Motorcycles because it will record time when you are trailering. Use our HR-9000-2 wireless meter specifically designed for Motorcycles. Easy Installation – peel & stick, no wiring necessary. Just plug and play! Note: See FAQ’s for additional information web page. 0.0 Your meter is now ready for operation.